What exactly is an Ethereum client and what clients are there? What exactly is an Ethereum client? Is it a full network node that can post transactions to the blockchain (if that is the correct lingo?) or could it also be a light JS client that connects from a browser to a full node? Could someone please shed some light on what clients there currently are and what roles they fulfil? An 'Ethereum client' is just a term. It refers to any node able to parse and verify the blockchain, its smart contracts and everything related. It also allows you/provides interfaces to create transactions and mine blocks which is the key for any blockchain interaction. All clients should work the same, from the user's perspective. They provide the same interfaces and so on. For example, if you launch a DApp or the Ethereum Wallet or a DApp browser instance, it should not note any difference in communicating with the client. There are a couple of "reference implementations" that the Ethereum foundation is supporting. There are a couple of reasons for doing this. Bitcoin was created in an isolated environment, because of this some bugs crept in that are hard to fix because they break the consensus and would require a fork. Because of this anybody wanting to build a app to support the Bitcoin protocol need to add these bugs in or they won't be able to get consensus. By supporting multiple clients from the start you have multiple people interpreting the white and yellow paper so any consensus issues will pop-up much faster, and they did. Luckily this is happening less and less as the technology matures. If there is an attack vector or bug in any of the Ethereum implementations it means the network is usually fine as there is a bigger diversity of clients available. As I'm writing this this is sadly not 100% true yet because Geth has a majority of the network but we hope that the other clients will grow in usage in the coming months. C++ is super fast, but harder to build or read. Go is easy to build, code and read but loses some of the speed. Java can be used in most Enterprise environments and has the best support for Android. Python is very easy to understand and read but gives up some speed to do it. Hope this helps understand it. 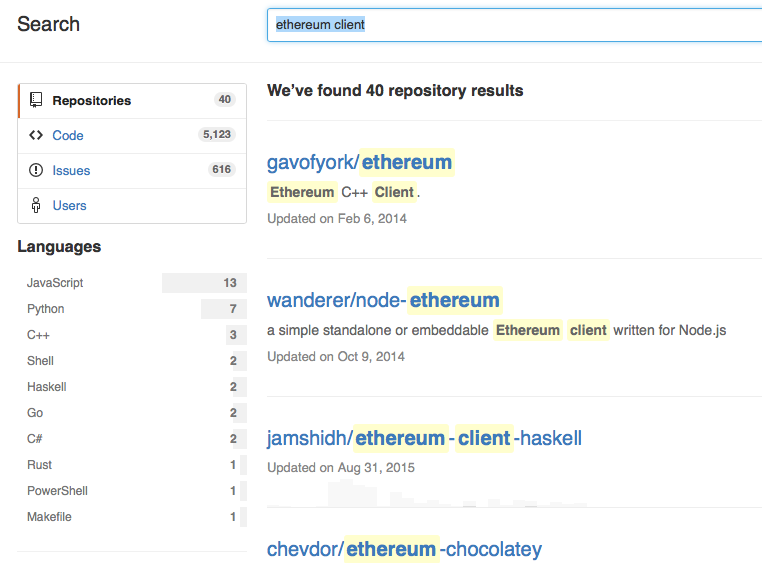 by the way, a github search resulted in a lot more list..
On Ethernodes, Geth has about two thirds, and Parity has most of the other third. I haven't seen the names for the other clients before. I looked up a couple of the tiny ones. Moac just provides an interface for Geth, Parity and Eth. Simillarly, Pirl (349) uses Geth. Eth (C++) has 9 nodes, ethereumJS has 27. Alot of the other clients start with g, indicating that they may be a custom/forked Geth client. Here's an archived snapshot of these stats. Not the answer you're looking for? Browse other questions tagged blockchain nodes clients consensus or ask your own question. What is Geth and What is Eth? Which Ethereum clients support running a full node? What advantages and disadvantages does Open Blockchain / Hyperledger / Fabric have over Ethereum? How big is the Ethereum blockchain now (May 2016)? And what is it expected to be in the future? Is there any SPV client for ethereum? Why are nodes sometimes called clients? Are there any other mining clients than Ethminer? Ethereum Uncles - What if there are conflicts? Are there different clients for Quorum compared to Ethereum? What is the main difference between “light client” and “client” in sense of “functionality” and “capability”? “Elkrem:” Does it install an Ethereum client on a micro-controller? What is the difference between an Ethereum client and Ethereum API?